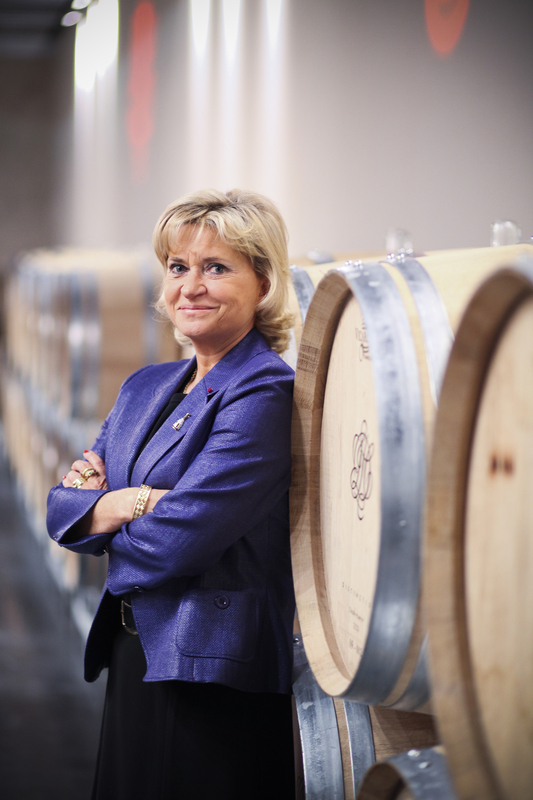 Carol Duval-Leroy, President of Champagne Duval-Leroy, joined the very select group of women involved in running champagne houses in 1991. After the sudden loss of her husband that same year, she became the company chairwoman. For ten years, modernization of production processes, development of traditional distribution channels, increased product range and expanded exports have all been Carol Duval-Leroy’s objectives for her company. Today, the brand’s whole image bears the mark of her passion for this profession. Over the past twenty-four years Carol Duval-Leroy’s key priority has been to raise the quality of all products of Champagne Duval-Leroy to the highest level possible. The mark of success: all range +90 in the Wine Spectator and 3 times the Best champagne in the world. On December 3, 2013, the Women’s Award Green Business prize from La Tribune Magazine in Paris was awarded to Carol Duval-Leroy, CEO of the Champagne Duval-Leroy. The prize rewards the actions and accomplishments of Carol Duval-Leroy for many years within her company, in favor of environmental protection and sustainable development. Champagne Duval-Leroy was founded in 1859 when two Champagne families came together to share their interests. Since its creation, Champagne Duval-Leroy has been located in Vertus, in the heart of “La Côte des Blancs”. Currently the House cultivates about 200 hectares, much of which is devoted to production of high quality Chardonnay grapes. With Roederer and Bollinger, Duval-Leroy is one of the few remaining 100% family-owned Champagne Houses. In 1911, Raymond Duval-Leroy revolutionized the Champagne world by creating the first Champagne crafted exclusively from Premier Crus grapes. His vision was to build a great Champagne house that would one day be known for exceptional quality, especially by the gastronomic world. Today, Duval-Leroy is poured in more than 250 Michelin-starred restaurants around the world and is a respected partner of the global sommelier community. Duval-Leroy was the only Champagne selected for Wine Spectator’s Top 100 in 2008. Duval-Leroy also practices sustainability at every level of vineyard management and winemaking, with a commitment to preserve the land while producing wines of incomparable quality and consistency. AWP: How do you explain the world’s love affair with Champagne: the culture, the people, the traditions, the wine? CDL: It’s a bit of everything! The culture of celebration is deep rooted and is becoming part of a tradition. For those who occasionally drink champagne, it will be for a birthday, a new contract or job, a romantic dinner… for others, it is the perfect way to start a meal or an excellent food pairing. CDL: The secret is the terroir and the know-how of champagne producers for centuries. First, the soil, the exposition, the climate are all a big part of champagne’s particularity. Then, the style is shaped by centuries of grape culture to perfect the process, planting a vineyard only in some selected places, and finally a quality agreement between producers that is imposed by a professional agreement. For example, keeping the wine for at least 15 months in the cellar before selling it. This quality process is not mandatory and not followed by any other sparkling wine regions. AWP: Yours is an amazing success story of a long-term commitment of creating a foundation for today and for future generations. What is the secret of leading extraordinary Champagne with over one hundred fifty-six years of history? What is the secret of its inimitable style? CDL: Yes, Duval-Leroy was created in 1859 between two families, Duval and Leroy, the first one a winegrower based in Vertus, the other one a merchant. The success is explained by the quality of our wines, made with quality grapes (a majority of premier cru and grand cru grapes), and the capacity to make it known. The development of Duval-Leroy through universal exposition, like Barcelona or Paris where we already obtained awards for the quality of our champagnes in the nineteenth and early twentieth centuries, is now followed not only by awards but also by being poured in more than 250 Michelin-starred restaurants. Our style is based on the same ground: quality grapes, predominantly chardonnay—contrary to other producers, and the fact that Duval-Leroy is producing all the cuvees it sells, again, contrary to many champagne houses. AWP: You are the family’s eleventh generation since two Champagne families came together to share their interests in 1859. What is this lineage like for you? CDL: My husband was the fifth generations—we start at the creation of Duval-Leroy, even if champagne producers existed before in the village of Vertus; it is difficult to get information before this date and for example we do not know how many generations of Duval already produced champagne in Vertus. My sons, the sixth generation, are all three working with me. Julien is secretary general, Charles is marketing and communications director and Louis is doing public relations. I am from Belgium and the lineage for me came from my husband. I cherish our independence and familial roots. We have a different perspective in what we do, from human relations to the importance of environment especially in the vineyard. I like to say that we borrow the land to the next generations. We act on the long term; for example, we have a vintage called Femme de Champagne 2000 on the market. This cuvée is 15 years old… and some treasures are still sleeping in the cellar! It is even a longer time when you plant a vineyard. The choice of a grape variety won’t be changed for the next forty years. AWP: Winemaking in France has been an industry dominated by men. When you entered the industry in 1991, at age 36, what were the challenges and how did you grapple with the cultural differences? How has it changed? CDL: I was only 36 and had 3 children. For managing such a company, that was far from the standard of the industry. I was not even from Champagne or French. Only a few thought I would be up for the challenge. What pushed me to success is the promise I made to my husband that I would transmit the familial company to our children. The challenges were numerous, but I overcame them. When I am looking back, I am first of all proud of what I have accomplished as a mother… that’s probably a main difference with my male counterparts! Regarding the wine industry in general, I doubt the situation for women evolved much. We always have to prove ourselves more than men. AWP: From 1940-1946, during the Second World War, many women tended to winemaking and running the Châteaux. How was it at Champagne Duval-Leroy? CDL: In Champagne Duval-Leroy, we suffered a lot during WWI and WWII. The battlefield was in the Champagne area during WWI. Production decreased to such a small quantity, with the men on the trenches, that there was not much to do for women: no wine to make or sell. Once the war was over, sustainable crops were preferred to vineyards. Jules Duval, director of the champagne house at the time, was honored for his role during the war with the French Legion d’Honneur. WWII is a different story. The champagne area was an occupied territory at this time. The French army lost very quickly and so men were not mobilized any more in the French army. There was no need for women to run a business. My predecessors voluntarily did not make wine because they did not want to sell it or have it seized by the Nazis. The size of the company considerably shrunk during this time to almost nothing…contrary to some other champagne houses. AWP: What is the best post-war vintage to date? What made this one of the truly great vintages? CDL: Picking one is too difficult for me! There are several that I would like to underline! 1978 and 1979 were amazing but I was not in Champagne yet. My first great vintage was 1982, the year my first son was born. In the nineties, we had a fantastic 1990 and 1996. Recently, my favorite vintage is 2002. 2008 is not released yet but will be Champagne’s next jewel! It depends on the climate and the blending, but some years the climate is perfect in the whole champagne region and for all grape varieties. When the vintage develops exceptional aromas through the aging process, those years are often remembered as the best ones. AWP: Respond to the demands created by the Asian market, the U.S. market, and the British market. Do you market differently to each? CDL: Yes, there is not a single market. For example, the Asian market as you put it does not exist. It is very different to promote champagne and our brand in Japan versus in China. In Japan we work closely with the sommeliers and restaurants and especially target champagne and food pairing. This is not as developed in China. The US market is also different depending on the states where you are. AWP: What are the great traditional culinary pairings with Champagne Duval-Leroy? CDL: I made a whole book (called Femme de Champagne) about this, and I am thinking sometimes about doing a new one! There are so many possibilities depending of the cuvée you pick. It is traditionally easy to pair champagne with fish. Yet some older vintages, like Femme de Champagne 2000, are magnificent with poultry and a creamy sauce with morels. I also love our Femme de Champagne Rosé with duck or pigeon. We even produced a rosé champagne, Lady Rose, in collaboration with Pierre Hermé with more sweetness to perfectly match desserts with red fruits, or his famous macaroons! AWP: What non-French cuisines are making an inroad into pairings with Champagne Duval-Leroy? CDL: Japanese cuisine! Your readers should try some sashimi or sushi with our Blanc de Blancs 2006. AWP: What unique and unexpected Champagne and food pairings have you found in your travels worldwide that bring us to new and exceptional flavor experiences? Are you working with French chefs at Champagne Duval-Leroy to adapt combinations discovered from your travels? CDL: Our cuvée Lady Rose is a perfect match with red-fruit dessert. Yet we were traveling in Singapore and Hong Kong, and sommeliers there made us try Lady Rose with spicy or sweet and sour dishes. It was a great surprise to me. Lady Rose was the perfect match and the red wines we tried were not good pairings. We learned from this trip that our cuvée was a great option on some dishes we thought would not be appropriate to any champagne. We are working with “Les Grandes Tables du Monde”, an association that encompasses many well-known chefs. We craft together champagne dinners. They choose in our range some cuvées to match perfectly some of their recipes, adapt them or even create new ones. We do not adapt combinations discovered from my travels, even if sometimes I tell them some hints about a pairing I just had and I found fantastic! AWP: Are Champagne and food pairings best left to the professional chefs and sommeliers or can we make some interesting and pleasing discoveries at home as a hobby? What is the simplest way to start? CDL: We are far too serious about the sommeliers, champagne dinners and products that are difficult to find or cook. Do that at home. It’s like a game. My cookbook with champagne pairings was about easy home recipes that came from my relatives. Chill the champagne before serving it, use a wine glass so the aromas will be revealed in a more appropriate way, and half the job is done! The best way to start is to put pleasure first! It is a learn-and-try process, but a fun one! – Chill the bottle before serving it. Ideally 10 to 15 minutes into an ice bucket. – Use wine glasses (I love tulip glasses for instance). – Start your meal with a glass of champagne for the aperitif. This is mandatory on Valentine’s Day! Also true for birthdays and dinners with good friends! – Don’t be afraid of opening the second and third bottles! – Come and visit us! Champagne might be the next trendy destination, as UNESCO might add it to the World Heritage List this year! Brut: Since 1859, the Duval-Leroy family has been perfecting the quality of their non-vintage Brut, balancing their passion with an aesthetic sensibility. The Maison Duval-Leroy revels in the art of blending Pinots and Chardonnays. Enriched with around fifteen crus and generous quantities of reserve wine, Duval-Leroy Brut confirms its complexity and is recognized for its consistency. A big, full-bodied bubbly, featuring graphite, toast, lemon and nut aromas and flavors, balanced with an assertive finish. It will improve with a few months of cellaring. It is ideal as an apéritif wine, and also provides a subtle accompaniment to white meats. Vintage 2006: The structure of Vintage 2006 is underpinned by an aromatic richness resulting from a particular combination of climatic conditions: low rainfall followed by a summer heat wave. The chalky mineral notes in this vintage Champagne are the typical expression of Chardonnays from the prestigious Côte des Blancs. A persistent stream of fine and bright bubbles adorns its color. Its elegant palate unfurls to reveal intense mineral notes with aromas of warm caramelized almond, white peach and hawthorn. To enhance the pleasure of tasting Duval-Leroy 2006 Vintage, pair it with a Mediterranean sea perch with lemon and olive oil or alternatively with a veal chop served with garlic and parsley juice and with a truffle-scented potato puree. Also, enjoy serving the 2006 vintage with fish. Rosé Prestige Premier Cru: The Brut Rosé plays on the theme of harmony and seduction in a modern context. Its bottle, with its bronze tints and delicate curves, holds a shower of pink-gold stars, which had become a paradigm. The delicacy of its bubbles, a string of fine pearls, escapes from the crystalline elegance of the airy neck of the bottle created by Carol Duval-Leroy. Its salmon color, created from Chardonnay and Pinot Noir, holds one’s eye and brings hints of amber to the fore. Its bouquet releases a wealth of aromas: wild cherries, figs and even a hint of ginger and geranium. Brut AB: Development, enrichment and the protection of the environment is part of the Duval-Leroy ethic. Our Cuvée Brut, an “ideological” wine, comes from vines cultivated with respect for nature. This cuvée has obtained the Ecocert organic certification, meeting standards and specifications at an international level. The winemaking process, partially using vats and oak barrels, preserves the grapes’ initial characteristics and at the same time develops high levels of concentration and a strong identity, while at the same time giving rise to a refined wine whose bouquet releases a pure, crystalline expression. This unctuous wine has a green-gold color, illuminated by slow, fine bubbles, which leave a remarkable sensation in the mouth. A wine for all occasions, its origins associate it with traditional local cuisine. Clos des Bouveries 2005: Close des Bouveries, overlooking the village of Vertus, is an ancient plot of land belonging to the Duval-Leroy family, which enjoys a mid-slope position facing due east. This situation provides exceptional conditions, producing one of the earliest growth cycles in the area and enriching the fruits with an intense concentration of flavor, giving a most favorable effect on the senses. A pioneer in the sustainable development of vineyards, the Great House of Duval-Leroy creates the concept of the oeno-climatic cuvée. The Clos des Bouveries cuvée is a vintage Champagne every year. The Champagne shows silver tints shaded by a yellow-green color, and lemon and pear aromas adorned by a subtle eucalyptus hint, followed by fine smoky notes. Femme de Champagne 2000: Carol Duval-Leroy and Sandrine Logette-Jardin, her wine maker, have together created a distinctive bottle with its rounded lines, which nurtures a great Champagne, golden like a jewel and soft like a fragrance, designed to gain approval from people of taste and distinction. The prestigious cuvée Femme de Champagne is the product of the development of select vineyard plots put in place by the House of Duval-Leroy. Femme de Champagne Vintage 2000 is an outstanding example of a special year. It is in the line of other unforgettable vintages, 1990, 1995 and 1996. Its yellow gold color carries fine strands of bubbles, which reveal complex notes of a lively maturity: brioche, vanilla and wood aromas alternating with citrus fruits such as lemon and mandarin. After the fine initial burst of flavor in the mouth comes a silky touch interwoven with remarkable length on the palate. Enjoy this wine with boiled eggs or caviar. Authentis Cumières 2005: Duval-Leroy’s passion for authenticity is illustrated in this cuvée derived purely from Pinot Noir grapes. The expression of a Premier Cru from the Vallée de la Marne, Cumières is the fruit of organic viticulture. This vintage wine for connoisseurs releases a bouquet with a powerful, balanced, and complex profile. The bouquet is marked by the concentration of Pinot Noir processed entirely in oak barrels. It has a yellow color with golden highlights. A close union of grape and soil, with profound respect for nature, this wine, with its harmonious depth, triggers a lively explosion of tastes in the mouth mixed with soft, warm touches, which will surely excite connoisseurs and lovers of unique flavors. The depth of this wine will be expressed when accompanied by a slice of grilled purebred farm beef, mashed potatoes with nutmeg and milled sweet corn. Wine in France: Charles-Erwan Savary, Champagne Ambassador to France, wine educator, and founder of “People and Wine”. Each type of wine is related to a different story, a different ‘mythology’ that comes from the improved quality of the beverage itself, Charles-Erwan Savary tells us. The history of the vineyard, the history of prestigious producers, the legend behind some producers and famous consumers… For sure Champagne lovers do not praise only the liquid itself, but also the myth of Champagne. Wine in France: Alice Paillard of Champagne Bruno Paillard on the delicate effervescence, remarkable purity, true freshness, and silky texture of Champagne style. It is probably the experiences abroad, combined with a fascination for the great wine that Champagne can be, that brought Alice Paillard back to where she grew up, in Reims. These contacts with very diverse cultures combined with the love for quality and the attraction of a young and dynamic company, gave her the will to join Champagne Bruno Paillard and help promotong her family’s wines through the world, in January 2007. Text copyright ©2015 Carol Duval-Leroy. All rights reserved. Leave a reply on "Wine in France: Carol Duval-Leroy, President of Champagne Duval-Leroy and respected partner of the global sommelier community, on the essence of exceptional quality Champagne"